Juan Santamaría (August 29, 1831 – April 11, 1856), is officially recognized as the national hero of the Republic of Costa Rica. A national holiday in Costa Rica, Juan Santamaría Day, is held every April 11 to commemorate his death. Santamaría was born in the city of Alajuela. When U.S. filibuster William Walker overthrew the government of Nicaragua and attempted to conquer the other nations in Central America, including Costa Rica, in order to form a private slave-holding empire, Costa Rican president Juan Rafael Mora Porras called upon the general population to take up arms and march north to Nicaragua to fight against the foreign invader. Santamaría, a poor laborer and the illegitimate son of a single mother joined the army as a drummer boy. The troops nicknamed him “el erizo” (“the Porcupine”) on account of his bald head. After routing a small contingent of Walker’s soldiers at Santa Rosa, Guanacaste, the Costa Rican troops continued marching north and reached the city of Rivas, Nicaragua, on April 8, 1856. The battle that ensued is known as the Second Battle of Rivas. Combat was fierce and the Costa Ricans were not able to drive Walker’s men out of a hostel near the town center from which they commanded an advantageous firing position. 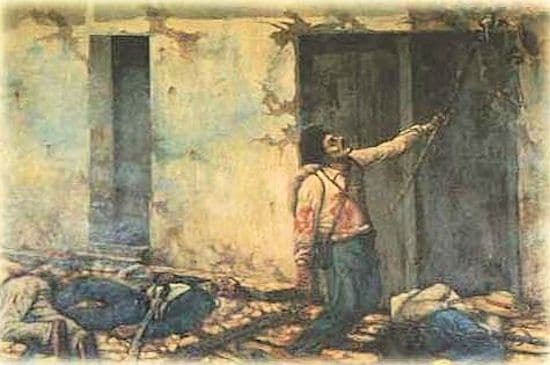 According to the traditional account, on April 11, General José María Cañas (Salvadoran) suggested that one of the soldiers advance towards the hostel with a torch and set it on fire. Some soldiers tried and failed, but finally Santamaría volunteered on the condition that, in the event of his death, someone would look after his mother. He then advanced and was mortally wounded by enemy fire. Before expiring he succeeded, however, in setting fire to the hostel, thus contributing decisively to the Costa Rican victory at Rivas. This account is apparently supported by a petition for a state pension filed on November 1857 by Santamaría’s mother, as well as by government documents showing that the pension was granted. Various historians, however, have questioned whether the account is accurate, and if Santamaria died or not during that battle or another one. At any rate, towards the end of the 19th century, Costa Rican intellectuals and politicians seized on the war against Walker and on the figure of Juan Santamaría for nationalist purposes. 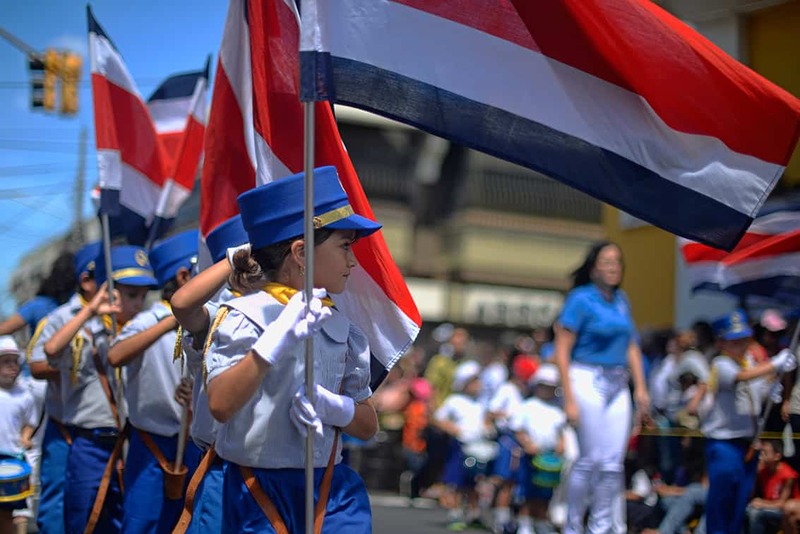 The days leading up to the national holiday on April 11 are celebrated with parades, concerts, dances and marching bands throughout the country, but festivities are particularly centered around the city of Alajuela. Ticos celebrate in style eating traditional foods and enjoying the special events. If you should visit at this time you will come to understand the real significance of Juan Santamaria Day. Previous Previous post: August 2nd , Virgin of Los Angeles Day in Costa Rica.